Good morning to you all today. Ellen just posted this on our Facebook group and I thought I'd share it with you all this morning. 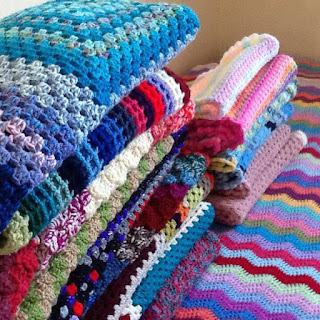 "Hubby asked me last night "how many of the 8,050" blankets do,you intend making. Told him I would equal what I made for my Syria boxes last year which was this lot.he has been married to me for 30 years but he is still telling everyone he is married to a crazy lady. If you don't think big you don't get anywhere"